I’ve been fortunate to put the basics of what I’ve learned about calligraphy and illumination over the years into a series of books produced by Walter Foster, a publishing company of art instruction books for over eighty years. 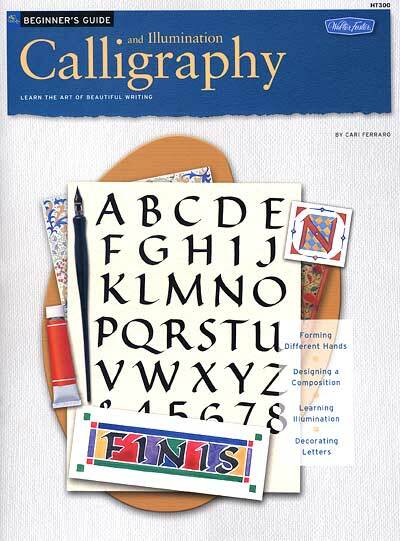 In 2006 they commissioned me to produce an introductory guide to calligraphy and illumination, presenting a variety of projects, included in a kit which had all of the components and tools necessary to do those projects. Since then my lessons have shown up in a few of their other books, most recently a new one, The Art of Calligraphy and Lettering. 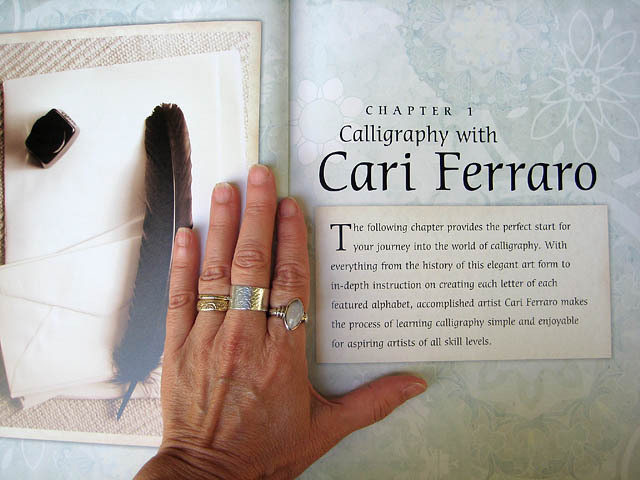 Above is a photo of the introduction page to the first of my two sections, with the decorative quill pen pictured next to my hand. Though this is not a true writing quill, it serves as a nice symbol of how I’ve always regarded my writing tools, as extensions of my own hand. This most recent book, part of their Collector’s Series, is certainly the most comprehensive and complete at 144 pages, with lessons from four different artists, all offering different perspectives. Two of the four sections, one on beginning calligraphy and one on illumination, are my lessons. Eugene Metcalf and Arthur Newhall, who for many years wrote Walter Foster’s calligraphy manuals, represent a graphic artist’s approach to calligraphy in the third section. The fourth artist is, most delightfully, John Stevens. 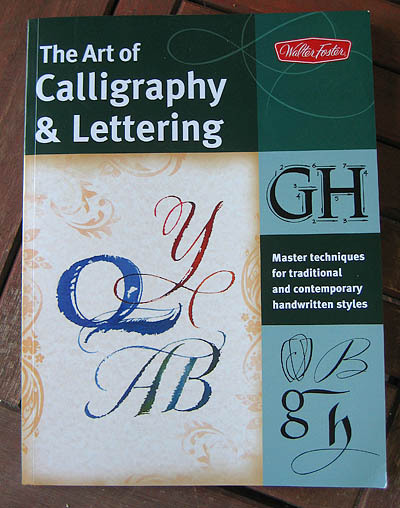 This lettering artist’s sheer virtuosity and highest quality work expands this book’s appeal and makes it a valuable addition to the field of calligraphy how-to books. John Stevens’ alphabets are for the more confident and advanced calligrapher who is able to write without guidelines, use a variety of tools, such as brush, pointed, folded and ruling pens, and is a bit more adventurous in approaching this art. I recommend purchasing this book from John Neal Bookseller. Of course Amazon has it, but they have inexplicably changed the title of the book to read “handwritten fonts” instead of “handwritten styles.” Fonts are computer-generated letters which, even with alternate characters, are mechanically made. There is a solid difference between a font and letters made by hand, and this is a book about handmade letters. And Walter Foster continues the fiction that you can make broad pen letters with a fountain or pointed pen nib, as shown in this regrettable picture. There is no way that line could have been made with that pen unless it was drawn and filled in. The kit for which I originally wrote the instructional content, Discover Calligraphy and Illumination, is not made anymore by Walter Foster. It can be found sometimes in the resale or secondhand market. 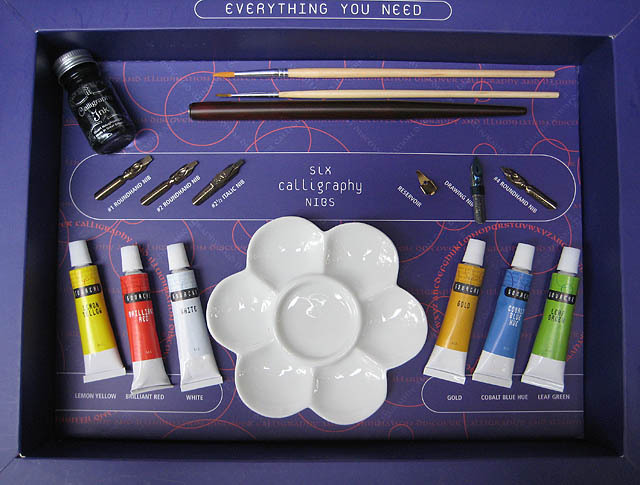 The company re-issued the kit after a year, subtracted one of the nibs, one of the color tubes, and increased the price, while still keeping the purple cover. This kit would be my recommendation if you have never tried calligraphy or illumination, because you won’t have to look for much else to get started, though I would use a high quality bond paper over the few pieces of paper they’ve included. Printer paper often works quite well. Beginner’s Guide: Calligraphy and Illumination (shown here with its original cover), keeps my lessons intact and offers my exemplars at their original larger size. This is probably the most reasonably priced calligraphy book on the market for quality instruction (and by that I mean that I have studied my craft with some of the best teachers in the field). John Neal has the Hiro Rond (roundhand) and Tape (italic) nibs here and here, and a good black carbon-based ink (not acrylic) will get you started. I began doing calligraphy in the seventies, and was entirely self-taught for about ten years. I copied from books, beginning with Jacqueline Svaren’s first and subsequent editions of Written Letters, and opened a business which forced me to practice more than I would have otherwise. Later on I discovered guilds and workshops and some wonderful teachers. Still, I honor those who teach themselves things from books, and I agreed to share my teaching with Walter Foster in this way to honor my own early beginnings. Not everyone has access to learning opportunities for this art and craft, but with a good eye, diligent practice and a good book, you can get a long way. Walter Foster has not always published my instruction in exactly the way I would have, but I am grateful to have my lessons out there for beginners, to help keep our love of the handwritten letter going strong! You can update the subtitle on Amazon very easily – just click the Update Product Info button. As an author you can do it more easily from your author central page, but I submitted the change from “fonts” to “styles” as a reader. If it doesn’t change in a few days, try again. The author has more power! It DID change the name on Amazon right away; thanks for the tip, Trish! I’ll keep an eye on it though. It may be they changed it to fonts because that is a more common search term. I see it all the time when I look at the statistics that show me the search words people use to end up on my site. 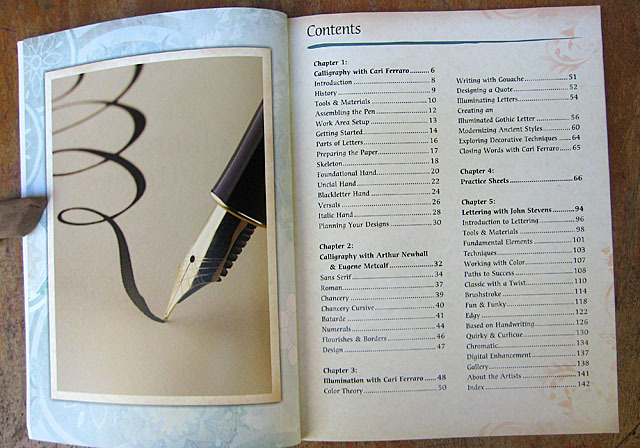 I still recommend buying the book from John Neal because he will also have the tools you need to get started, and calligraphy tools are not all that common in art stores anymore. Actually, the subtitle came from your publisher’s database (or the wholesalers). If it changes back to “fonts”, ask your publisher to check their database, and fix it at the source! Thanks Trish. I suspect the wholesaler, since the name is correct on the publisher’s website. The ins and outs of the publishing world! My Beloved wife says you shouldn’t feel bad about the font/style change. They did it, she says, because publishers are stupid and think their customers are too. And it does put you in the same league as J.K. Rowling; Harry Potter and the Sorcerer’s Stone indeed! Did they think that no-one would look up the subject of alchemy and discover the philosopher’s stone?? Thanks, Neil. Nice to think of being in the same league as J.K. Rowling, thought I don’t think I’m in the same income category (though she did publish a handlettered book a couple of years ago which sold for a ridiculous amount of money). Someone suggested that Amazon or the wholesale distributor might have changed it because that is the search term that people use now. We can only gently correct where we can, and let the rest go.